Linkin Park are sharing a preview of their upcoming appearance on the next episode of the Guitar Center Sessions series. On the road in support of their latest album, “The Hunting Party”, the band were recorded in concert at The Wiltern in Los Angeles in October as part of the Guitar Center’s 50th anniversary celebrations. "We're honored to be part of Guitar's Center's anniversary celebration,” said Linkin Park vocalist Chester Bennington, “and excited to share this special performance with the world on Guitar Center Sessions." 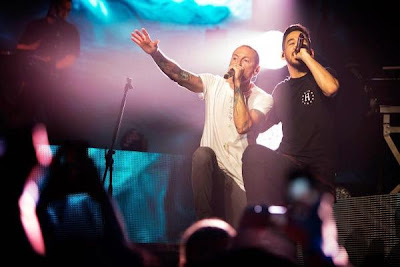 Guitar Center Sessions with Linkin Park will be broadcast on December 5 at 9pm on DIRECTV's AUDIENCE (channel 239).